Tuesday, December 28, 2010 Tamar Snyder and Staff reportsAs this week’s blizzard blanketed New York City in snow, Jewish Community Councils and other organizations scrambled to continue providing much-needed services in the hardest-hit neighborhoods, as well as meet emergency needs.“All of our home care workers got to the homebound clients across the city,” said William Rapfogel, executive director of Metropolitan Council on Jewish Poverty, adding that the agencies serve some 2,500 clients a day. In addition, the organization’s affordable housing has been able to serve as a resource for not only the residents but in some neighborhoods, the community as well. “Some of our residents in places like Sea Gate, Brooklyn, and Co-Op City, The Bronx, have been able to help others who came in for a warm place,” Rapfogel said. October 6, 2010 REGO PARK, QUEENS -- City Councilmember Mark S. Weprin (D-Oakland Gardens) recently visited the Orenstein MetCouncil Masbia Community Kitchen on Queens Boulevard in Rego Park, where a soup kitchen serves nutritious meals to thosein need. “Masbia is doing a tremendous job in feeding the hungry here in Queens,” Weprin said. “At a time of economic downturn, people rely on this service to help make ends meet.” Masbia soup kitchen started as a grassroots charity to feed the hungry. 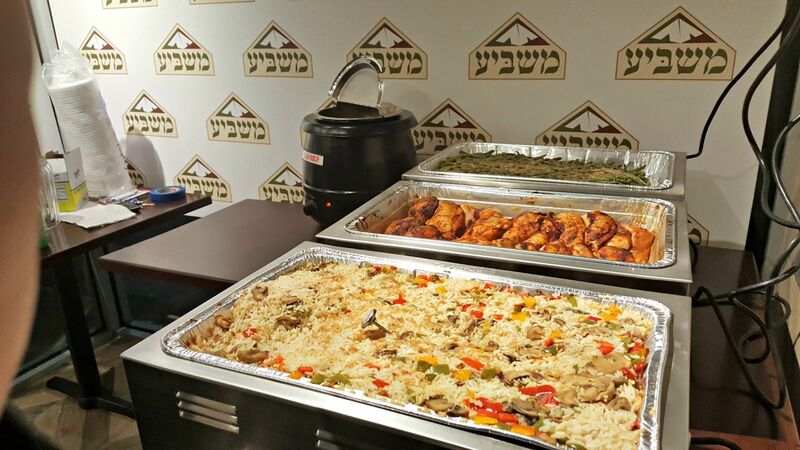 Over the past five years, it has served more than 250,000 kosher meals. Masbia operates soup kitchens in Queens and Brooklyn. Monday, Septmeber 13, 2010, 12:00 AM ESTby Pete Davis REGO PARK, QUEENS -- State Assemblymember Andrew Hevesi and State Senator Joe Addabbo recently took a tour of Masbia Soup Kitchen, the only Kosher soup kitchen in Queens. Masbia, on Queens Boulevard in Rego Park, opened in March with the help of Henry and Susie Orenstein via the Metropolitan Council on Jewish Poverty, and it is already serving more than 120 people a day, five days a week.Every Thursday, clients – mostly local seniors and families with children – are given weekend packages of cooked and raw food to take home. Updated July 12, 2010 12:01 a.m. ET By: Melanie Grayce West This filet has soul. The Stefansky family, owner of Brooklyn kosher fish company Dagim, is donating 2,500 portions of tilapia, flounder, salmon and tuna to the city's only kosher soup kitchen. The donation arrives on time for the "Nine Days," a mourning period that began Sunday evening and ends with the Jewish fast day of Tisha B'Av. Fish can be expensive, especially for a soup kitchen that relies primarily on private donations to serve about 450 kosher meals a night, says Alexander Rapaport, director of Masbia, the soup kitchen. Monday, 21 December 2009Written by Christina PisanoSoup kitchens are traditionally associated with processions of the hungry crowding city sidewalks outside centers where food is offered in a mess-hall style for free or for a very low price. The long wait draws unwanted attention from passers by, heightening the shame often associated with poverty.Masbia, meaning "satiate,” was founded in Borough Park in 2005. It became the first soup kitchen of its kind serving the hungry in a restaurant-style center, offering kosher food and a seat at a natural wood table with leafy green plants, to allow the diners some privacy. Patrons were offered entrees balanced with protein, starch, a vegetable, and dessert, as well as an array of fresh breads to complement the hot soup. By COREY KILGANNON MAY 12, 2008 The poor and hungry people at the Masbia soup kitchen in Borough Park hardly fit a bums-and-bag ladies stereotype. The storefront, on 14th Street in central Brooklyn, in one of New York’s largest Hasidic communities, serves only hot kosher meals. Its operators say it is the only soup kitchen of its kind in the city, and at first glance it seems to have a dress code that is also unique. The men — and it is mostly men — wear dark suits, white button-down shirts and black hats. “From a distance, they may look no different than a rich man, but if you look closer, you can see the difference,” said Mordechai Mandelbaum, a co-founder of the soup kitchen who was also dressed neatly in the traditional Hasidic garb on Thursday night. Indeed, closer scrutiny of some of the patrons revealed subtle signs of hardship: a slightly smudged shirt, a somewhat rumpled suit, a bruised felt hat. The few women were generally seated away from the men and dressed in traditional skirts and wigs, some with small children. Tuesday, December 11th, 2007 On Sunday, December 9, the Fifth Day of Chanukah, Masbia graciously hosted a festive Chanukah Party and it was a dazzling hit! The doors opened, the guests of honor, women and children, entered and they were inspired by the delightful atmosphere. Food and friends, fun and family combined to create a spectacular experience.Masbia wanted to reach out and share the miracle of the Festival of Lights. Masbia wanted everyone to have an opportunity to enjoy the magic of the Chanukah. Masbia wanted to provide an ambiance of warmth for both body and mind.This gala gathering was another significant milestone in the success story that is lovingly known as Masbia.